(P1) Facebook and Google are teaming up to speed Internet traffic between North America and Asia. (P2) Today, alongside partners in Asia, the two Internet giants announced they will build the longest and highest capacity undersea fiber-optic cable between the two continents. Once completed, the Pacific Light Cable Network, PLCN for short, will stretch 8,000-miles from Los Angeles to Hong Kong with an estimated capacity of 120 terabits-per-second. That’s about twice the capacity of the Oregon to Japan cable “Faster,” which Google recently launched with several telco partners. Construction of the new cable will begin this year, and it should come online in 2018. (P3) The move highlights the larger role that tech giants like Facebook, Google, and Microsoft are playing in the construction of telecommunications infrastructure. Just last May Facebook and Microsoft teamed up to build a new 4,100-mile cable, connecting Virginia to Spain. PLCN is the sixth undersea cable that Google has invested in. (P4) These investments, which give these companies dedicated capacity on these undersea cables, represent a big shift in how these cables are built and managed. Earlier this year, Jonathan Hjembo, a senior analyst at Telegeography, told us that private networks now account for about 60 percent of the capacity of trans-Atlantic traffic. (5) These underwater cables will help increase the total bandwidth available not just to the giants that build them, but for pretty much everyone else as well. And they improve the resilience of the global Internet by increasing the number of routes that data can travel across the oceans. But more to the point, they also give Facebook and Google more control over the infrastructure they depend on. (P6) Undersea cables are just a part of that investment. Facebook and Google’s wilder Internet connectivity projects, using drones or high-altitude balloons to deliver connectivity, for example, get most of the attention. But both companies have invested heavily in buying up unused fiber-optic infrastructure in the US, helping them ferry data back and forth between their data centers, bypassing the public Internet. As these companies grow and dominate the Internet, they’re increasingly independent of the infrastructure that actually defines it and evolving into networks that stand on their own. In your opinion, do you think the internet will be free to everyone in the future? Why or why not? 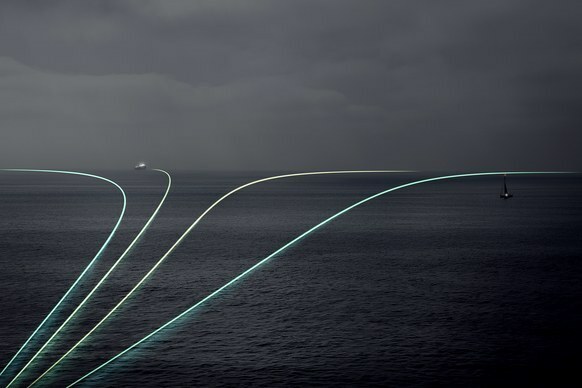 In your opinion, do you think the undersea fiber-optic cables will become obsolete? Why or why not? Does your country offer free wi-fi now? If not, should they? Why or why not? Which two regions will be linked together with a fiber optic wire? Which tech Giants combined their efforts to run a cable across the Atlantic Ocean? Who is purchasing fiber-optic infrastructures that are not being used?